If you do not have a large budget and are a large organization, I would steer clear of Actuate. If you are looking to do very complex washboarding, I would not use them. Your developers have to be very skilled to work with this. Plan to bring in consultants if necessary to help your process. Adhoc reporting is weak. If your pricing is user based and you expand, this could be very expensive. The integration with JIRA is quite a handy tool to have. It allows for team progress to be easily tracked and visualized using the software while key metrics are brought to the forefront through the software's business intelligence. It makes presenting data and milestones achieved to non-technical management quite simple and can be extremely useful. Securing the BI system is also a strength and the system can be configured relatively easily. This allows us to keep track of our team's work by integrating with our product boards on JIRA. It allows us to create visualized reports for our team's progress. It allows us to gain insights about things that are going well in our product pipeline as well as potential areas of concern based on the data that is collected. The service tends to be slow at times and working offline can be a pain. It has a bit of a learning curve when you start out. The price is quite high for the features it offers. This rating would be a 10 if the licensing structure were more accommodating. We looked at a few other competitor's products but based on value for features chose Actuate for its total cost of ownership. Jama Analyze, as well as Asana, connect with JIRA to visualize milestone tracking and team progress. While Asana is cheaper, Jama Analyze provides better reports and visual data. Google Data Studio, through a bit of tinkering from your software development team, can achieve similar results, however, the charts and graphs leave a bit to be desired in terms of design. In all, Jama Analyze is great if you have few users and don't need to go for the licensing option. Otherwise, there are definitely cheaper options available but you may have to sacrifice on performance and look-and-feel. 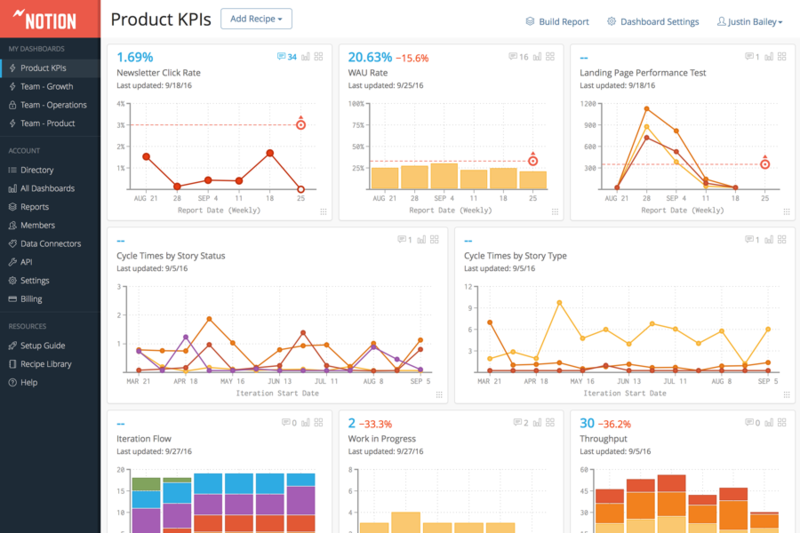 An example of a Notion dashboard with custom team metrics, a variety of visualizations, and summaries of the data at the top of each card.